The Escapist invites you back to the 80s, no DeLorean required. One of the great things about Donkey Kong is that climbing ladders, hammering apart barrels, and reaching the princess just never seems to get old. Here we are, more than a quarter-century since the first Jumpman got face-planted by an errant spring, and we're not only still interested in running the course ourselves, but even happy to watch other people do it instead. The same can be said for most titles of that golden era of 1980s arcade, so in celebration of those games (and the people who love them) we're pleased to announce the addition of a free retro arcade to this year's Escapist Expo! 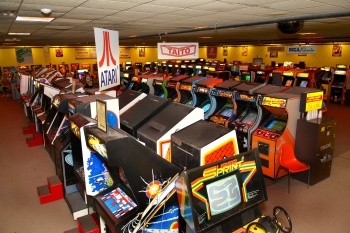 The Escapist has teamed up with the American Classic Arcade Museum to bring between 25 and 30 old-school cabinets for a weekend of tournaments and free play over the course of our three-day Expo, September 14-16. For those of you unfamiliar, the ACAM is a non-profit organization dedicated to promoting and preserving the history of coin-op arcades, covering games from before the 20th century all the way up to the late 80s. Normally, you'd have to hitchhike to New Hampshire to find them on the third floor of Funspot (the largest arcade in the world), but this year, their crew of joystick-flicking button-pressers will be traveling to North Carolina to meet the (in)famous Escapist community and check out their retro skills in person. We'll be announcing more about the arcade's location, and the specifics of the tournaments soon, but the only way you can play is if you're there. So, if you haven't registered yet, you can fix that right here.